‘My Journey Began with Ants’ Uma Sarwadnya '19 knew she wanted to be a doctor her whole life. 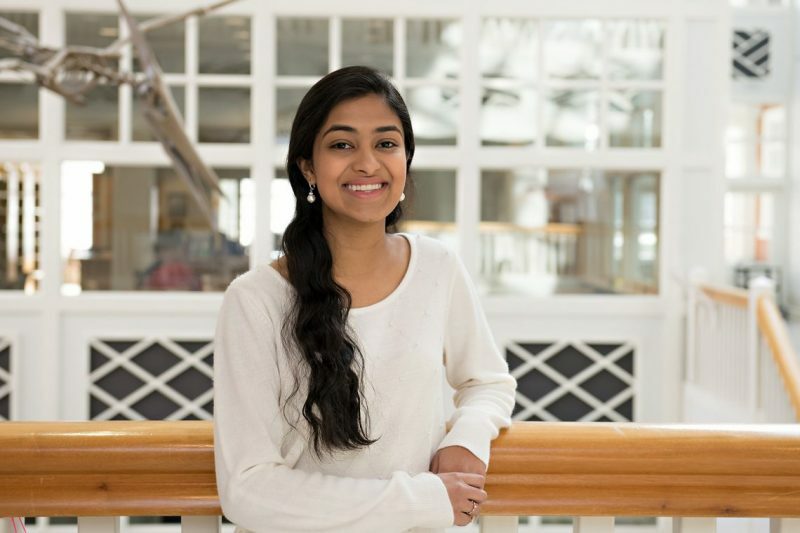 What she didn't know was how many unique opportunities she would find at W&L to support her journey — including a project with ants. I’ve wanted to be a doctor my whole life. For me, research was also an integral part of my scientific career. During my first tour of W&L, I learned that I could be involved in research as early as my freshman year. This opportunity, paired with the friendly atmosphere of the school and the close-knit community of faculty and students, drew me to W&L. I knew immediately that W&L was the school for me. What I didn’t know was that my journey would begin with ants. My freshman year, I conducted an independent research project under the supervision of Dr. William Schreiber, a faculty member in the Psychology Department who studies animal behavior. I was interested in the decision-making process of ants. There are many features which affected an ant’s tendency to either approach or avoid other insects, such as caste (what the ant’s job is within the colony) and the size of the insect that confronts them. We planned, developed and ran an experiment using crickets (ordered right off of Amazon.com) to see how the circumstances of the confrontation affected the behavior of our little test subjects. Sometimes, the animals showed aggression, and I witnessed a massive showdown involving an ant and a cricket twice its size. In other cases, they showed avoidance behavior, retreating as far as possible away from the cricket (the way most people might react to a large bucket of live crickets from Amazon.com). In addition to learning about research design and methods, this experience taught me many other things about being a research scientist, such as how to pay meticulous attention to detail when evaluating data. I then met Dr. Sarah Blythe, a professor of biology who investigates the cognitive and metabolic effects of obesity in rats. I became interested in her research so I joined her lab as an HHMI fellow. I learned how to do rat care, laboratory techniques (such as staining and imaging), and behavioral tasks that tested memory and learning. I have been working in the Blythe lab since my freshman year, researching during the academic year as well as during the past two summers. One of my favorite research memories involved an obscure protocol that called for fresh eggs hot off the press (or in this case, the hen). My lab mate and I ventured to the Lexington Farmer’s market, and approached every stand that was selling eggs. After this long morning of networking and strange stares from the farmers, we headed back to the science building only to meet a local W&L student who owned a farm and ultimately became our supplier. My days in the Blythe lab were filled with questions about how to implement what we read in the literature using our own specific experimental designs. These projects enhanced my ability to troubleshoot and think creatively about research solutions. I have had multiple opportunities to present my research, such as presenting a poster at the Central Virginia Chapter of the Society for Neuroscience symposium, W&L’s Society for Science and the Arts’ biannual conference, as well as the annual meeting of the Society for Neuroscience. These experiences have allowed me to truly appreciate the importance of research and gain a deeper understanding of how health affects cognitive and behavioral processes, confirming my aspirations to pursue a medical career. This was supported by other opportunities I have been afforded through W&L, such as the Richmond Term, which allowed me to shadow physicians from different specialties and closely observe the diagnostic process. My research has been enhanced by the classes I have taken in pursuit of my neuroscience major. For example, Medical Anthropology, taught by Professor Harvey Markowitz, furthered my understanding of how medicine is affected by culture and way of life. In this class, we learned how communities’ beliefs affected healthcare and how to preserve and respect these traditions. Extracurricular activities, such as being a part of Red Cross Club and coordinating blood drives or being able to talk to patients as a volunteer at the medical/surgical floor of Stonewall Jackson Hospital, have validated my plans to pursue a career in medicine. However, my research added a new facet to my health interests that I hadn’t considered before, specifically in the domain of public health. How do scientific discoveries inform policies that help people? How can we ensure the health of an entire community, especially for those who cannot afford healthcare? Through research, academics and extracurricular opportunities, W&L has unlocked a new realm of possibilities for me, merging my interests in medicine and public health. I plan to explore this more following graduation. It has helped me understand how neuroscience is connected to behavioral and cellular/molecular research, and to envision how that might contribute to a better way of implementing policies in public health. I’ve always loved science. I knew I wanted to be a neuroscience major because, to me, it was the science of knowing myself. It’s literally the brain studying the brain. I’ve always been fascinated by the biological processes behind how we interpret the world around us. I met Kim Hodge when I attended Sustainability & Leadership Pre-Orientation my freshman year. She immediately created a sense of home for all of her students, making sure that everyone felt supported. Even two years after the trip, she is one of the first people I turn to when I need advice. She is one of the kindest people I have ever met. My weekly motto comes from whichever musical I’m listening to that week. My most recent quote that gets me through the day is “We rise, we fall, we break and we make our mistakes” from “Hamilton.” It’s a nice reminder to persevere. Napa Thai is my go-to, I love their vegetarian spring rolls and the garlic vegetable dish. One of the first classes I took at W&L was Health Neuroscience with Professor Schreiber. I loved his class because not only did we learn about the basic anatomy and pathways in the brain, but we also learned about the immense possibilities in the field of neuroscience. At first, some of our ideas seemed crazy, but they turned out to be attainable. I love playing in the Holiday Pops concert that happens in December. The concert features many of the music ensembles that W&L offers, and the music is so cheerful! Usually, the Winter Wonderland Holiday Dessert Reception is right after this concert. So it’s amazing music followed by amazing desserts.